Alopecia is the loss of hair from the scalp, face, body or all three. Approximately forty-six types of Alopecia exist and most of them are a symptom of illness or changes in body chemistry. Fortunately, nearly all are curable and with the right Alopecia treatment, hair nearly always grows back. Diagnosis is essential, as this will give a very strong indication of the prognosis or likely outcome. Alopecia affects males and females and can vary in appearance from tiny random bald patches to total baldness. Although the condition does not cause the sufferer any physical pain, it can be the source of deep emotional distress. Here at the London Centre of Trichology we offer a free hair loss diagnosis appointment to all clients. Our alopecia treatments are all 100% drug free and cause no side effects. Alopecia Treatment London – For male or female alopecia treatments, contact us now to arrange your free initial consultation at our London clinic. This is a common condition, where normal hair growth is interspersed with totally bald, round or oval patches. It often begins in childhood and reoccurs throughout a person's lifetime, but rarely affects the elderly. In most cases, the condition is confined to one or two spots, but it can spread and become Alopecia Totalis, where the entire scalp becomes bald. Alopecia Universalis is an even more distressing, but rare condition where the hair is lost on the head, face and body. The immune system, which fights off viruses, bacteria and foreign tissue, turns and attacks the hair follicles stopping hair growth. Trophoneurotic - Relating to nerve damage or change. Genetic Influences – There is a genetic link with being prone to autoimmune diseases. Alopecia Areata sometimes occurs in people whose family members have suffered from diabetes, rheumatoid arthritis, thyroid disease, systemic lupus erythematosus, pernicious anemia or Addisons disease. One in five people with the disease, have a family member who has had Alopecia Areata. And if the relation lost their first patch of hair before age 30, the risk to other family members is greater. Atopic States - Alopecia Areata does seem to be more common in those people prone to eczema, asthma and nasal allergies. Emotional Stress - This is thought to frequently trigger alopecia and its influence has long been underestimated by the medical professions. Alopecia Areata often affects the finger and toenails. They may show longitudinal ridges or pitting of the nail plate. The sufferer may also be more prone to eye disorders and Vitiligo, where patches of skin lose their pigment. The bald patches sometimes form very rapidly. 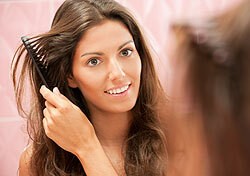 As they spread, the hair bulbs (papillae) fail to produce normal hair before they stop working. This causes the hair to be finer just above the scalp at which point the hair breaks off. If you examined these hairs under a microscope, you'd find that instead of being round/oval they are shaped like an exclamation mark. As this type are only found around the perimeter of a rapidly growing patch, they are a clear indicator that the patch is still growing. An absence of exclamation mark hairs shows that the patch has reached its full size. This form of alopecia predominantly attacks dark pigmented hairs, white hairs are usually not affected. If the amount of hair loss is minimum and the patches are fairly small, hair re-growth will often start in the centre of the patch within a period of three months. White hair often grows back in its place, but normally regains its real colour within a few weeks. If the problem is continuing, old patches will re-grow as new patches form. In rare cases, the patches continue to spread and multiply until they merge into each other eventually leading to total loss of hair on the scalp. Hair Loss & Alopecia Areata Treatment - For more information and to arrange your free initial consultation, call The London Centre of Trichology on 0207 935 1935.